Scientific Name: Codium fragile Codium fragile washed ashore in Goucester, Massachusetts. Identification: Codium fragile, or "Dead Man's Fingers" is a seaweed named for its dark green color and soft, felt-like texture. 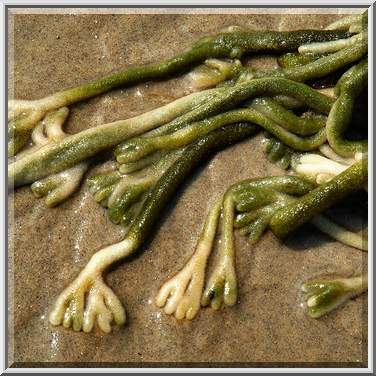 It has earned the common name "Dead Man's Fingers" or "Green Sea Fingers" for its swollen, finger-shaped branches that float in the water, or hang down the sides of rocks and cliffs when the tide is out. These "fingers" consist of plump, rounded branches which may grow up to 1 meter long, which originate from a central fleshy mass commonly referred to as a "spongy, basal holdfast". Codium growth pattern is bush-like structure, in bushels of up to two feet across, distinguishing it from Kelp seaweed forests, its neighbor along the Northeast coast of the U.S., which grow vertically, like trees in a forest. Codium prefers warm water temperatures of approximately 24°C for optimal growth and reproductive success, but tolerates a wide spectrum of water temperature and salinity. Requiring low sunlight, so grows well in light obstructed areas, including developed coastal areas featuring human-wrought structures, beneath and upon which it may attach and thrive in the shade. Codium fragile is a native to the coastal areas of Japan. Codium fragile has made its way around the world, growing along the coasts of Southwest Africa, Australia, southern Argentina, Chile, China, Denmark, England (particularly the British Isles), Ireland, Korea, Atlantic and Pacific coasts of North America, Norway, Netherlands, New Zealand, Scotland, and Sweden. Traveled from the Asian Pacific, particularly Japan, to mainland Europe. From there, it was introduced to England, to the River Yealm in Devon, in 1939, and first discovered at Steer Point. The first recorded sighting in the U.S. occurred in 1957 on Long Island, New York, followed by Boothbay Harbor, Maine in the early 1960’s. Since then, Codium has spread up and down the east coast of the U.S., heading north to the Gulf of Saint Lawrence, and south to the Carolinas. A full-scale invasion is occurring in Massachusetts, where codium is washing up in such large quantities in some Cape Cod communities that beaches must be closed to the public. Its main method of transportation from port to port is believed to be on the hulls of ships, or attached to captured shellfish. Human activities including boating and shellfish collection also contribute to dispersion. Codium fragile has become well established in a wide variety of climates in its current distribution. This success is due to the seaweed's versatile requirements for sunlight, nutrients, and reproductive conditions. Codium grows best in low sunlight, which helps it to thrive in light obstructed areas, including developed coastal regions featuring human-wrought structures, beneath and upon which it may attach and thrive in the shade. Thanks to advanced storage capabilities, Codium fragile can rely on reserves of nitrogen during seasons or in areas of limited resources. Thus far, Codium has resisted conservation efforts to reduce its prolifity via reproductive versatility: Dead Man's Fingers can reproduce sexually, when a female gamete is fertilized by a male gamete; parthenogentically—when the female gamete develops into a new individual without fertilization; or vegetatively--when a genetically identical individual is formed from a branch or stem of the parent plant. Codium fragile grows along intertidal bands close to shore, or along the shore in caverns and tidepools. It prefers areas that are unlikely to freeze, and grows well in sheltered areas including harbors and bays. It is a source of food for many invertebrate species, though not usually a primary food source. Codium provides an important service for the Alesia sea slug, which takes chloroplasts from its siphonous branches, and stores them in a gland where the choroplasts help to produce the slime used by the slug in locomotion. In new habitats, codium displaces native sea grasses and seaweeds, disrupting life for the multitude of fish and invertebrate species they contain. Codium fragile is consumed by humans in some areas of its distribution, and is used as feed for various species of invertebrates in the mariculture industry. On the surface, Codium becomes an aesthetic nuisance along the shore where it wraps around rope and dock pilings, and washes up to rot on beaches, emiting a pervasive stench. Beneath the surface, however, it is a well-armed invader. Inherently damaging to shellfish, Codium adheres to shells to serve as a home base. By wrapping its roots and branches around shells, it impedes the locomotion and feeding of shellfish such as oysters, mussels, and scallops, and may dislodge them from the seafloor. In addition, Codium tends to overgrow and smother oyster beds, earning it the fisherman's label, the "oyster thief". This species is also likely to displace native seagrasses and seaweeds, such as eelgrass, or kelp species. 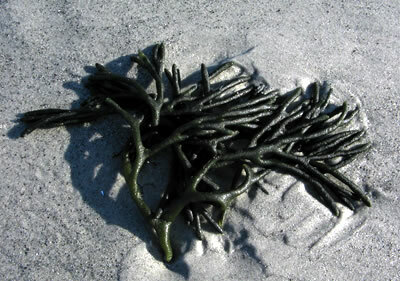 Because of its bush-like growth pattern, Codium is considered a "low-lying alga". 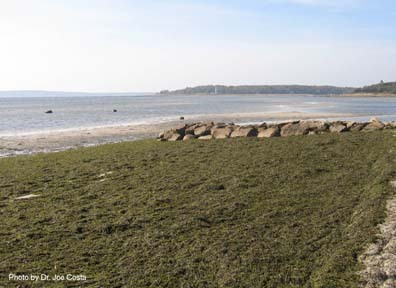 Dense bushels prevent larger species of fish and mammals from swimming freely through intertidal areas. North Atlantic coasts are particularly affected by this aspect, where native kelp forests traditionally allowed for easy movement, food, and shelter, and nurseries to a diversity of fish species. Many species of sea urchin also depend on kelp for food and shelter. Codium obscures these relationships, reducing sea urchin populations. In areas of complete overgrowth, Codium has annihilated the kelp beds of the North Atlantic, off the coast of Nova Scotia and Maine. Because Codium bushes do not offer the same resources as Kelp forests, in areas where it is replacing Kelp, traditional communities give way to a Codium-dominated ecosystem. Control Level Diagnosis: Medium Priority / Pest. In Europe, Codium fragile is one of the top 5 high-risk invasive species. Control Method: Due to ecological durability and rapid and versatile reproductive rate, chemical and mechanical removal options have been ruled out. Studies are in progess to determine natural parasites.